(Photo: Ecumenical News / Peter Kenny)Bishop Julio E. Murray addresses a press conference in Budapest, Hungary during the 14th Assembly of the Conference of European Churches (CEC) on July 5, 2013. BUDAPEST - A common and differentiated way is needed to shift from cultures and economies of greed to sufficiency, a Latin American church leader has told a European church body meeting here. 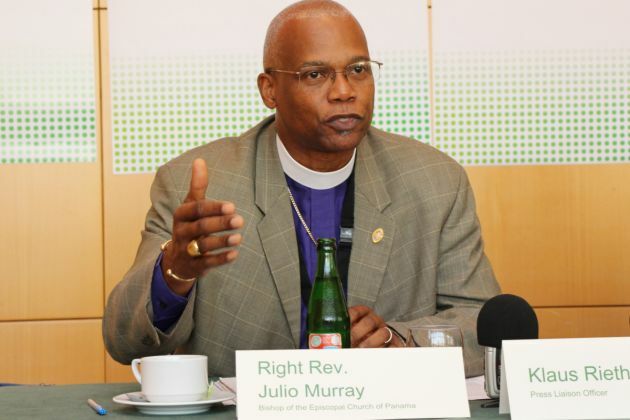 Bishop Julio E. Murray, former President of the Latin American Council of Churches (CLAI) was speaking at the 14th Assembly of the Conference of European Churches which is meeting in the Hungarian capital. Murray is the Bishop of the Episcopal (Anglican) Church of Panama and was delivering the keynote address Thursday of the meeting which aims to find ways of streamlining the churches body. "Witnessing to our Christian faith requires us to offer spiritual and practical resistance to economic injustice and ecological destruction and to do everything we can to promote an economy in the service of life," he said. The bishop urged a renewal of the ecumenical movement's commitment to the poor and spoke to CEC delegates from his context of Latin America to the delegates from across Europe. "The neoliberal economic system has produced in the so-called third world countries a growing number of impoverished, marginalised and persecuted people. "When the global market is left to its own devises and desires, it has serious negative consequences, most noted the exclusion and exploitation of the majority of the world's population." In a strongly-worded critique of capitalist economic and fiscal policies Bishop Murray added: "The problem is with unfair rules designed by affluent governments to advance their own commercial interests." During his keynote talk, the immediate past leader of CEC's sister organisation in Latin America, Murray argued for an 'economy of sufficiency' rather than a "prosperity built on disproportionate and unjust debts. "We need - in a common and differentiated way - to shift from cultures and economies of greed and de-limitation, to cultures and economies of sufficiency."